Immune function is a delicate balance between competing subsets of immune cells. Allergy sufferers are apt to have a predominance of one subset of immune cells known as T-helper cells. Those with this kind of imbalance are also more prone to autoimmune diseases, infections, and even cancer! Rebalancing this immune issue lies at the heart of allergy cure, and there are no better herbs for this than the traditional Chinese herbs, Astragalus and Reishi. These two herbs are revered in traditional Chinese medicine for rebalancing the immune function, and both have been demonstrated effective for allergies in clinical trials. Astragalus and Reishi are to be found, moreover, in both the Deep Immune® Original and Deep Immune® for Allergies formulas. So too is Schisandra, which is a vital tonic and used for allergies and asthma in Chinese medicine. Deep Immune® has long been used as an effective allergy remedy, mitigating the oversensitivity of the immune system to harmless substances that cause allergic reactions. 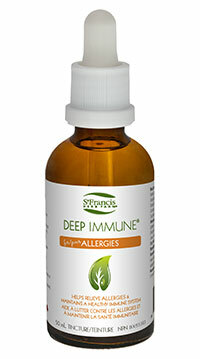 Deep Immune® for Allergies goes one better, combining the best of two therapeutic worlds. It is supercharged with special allergy-relieving herbs and gentle homeopathic ingredients to provide non-drowsy natural relief for itchy eyes, sneezing, congestion and all the other discomforts that accompany allergies. There is wisdom and method in the design of this superbly effective formula. Its homeopathic ingredients address the acute symptoms of allergy; while its herbal components tackle the underlying, chronic mechanisms by which such symptoms arise.